McKees Rocks history shows that it is one of the oldest places of human habitation in Eastern North America, and might easily have become the site of Pittsburgh, but for the chances of history. As the last Ice Age ended about 10,000 years ago, glaciers and water receded, and land again began to appear, revealing the hills and valleys we now call home. The area around the Ohio River Valley teemed with wildlife, and the clean streams contained plentiful supplies of fish and other marine life. Early Native American peoples found this an ideal place to live and engage in some agricultural pursuits, making use of the fruits, berries, and other foods that grew wild in the valley. Settlement at this historic spot dates back some 5,000 years, to a time when Greece and Rome did not exist, and when the early civiliations of Egypt and Babylonia had hardly begun. Back around 3,000 B.C. this spot was a sizeable town for the day, according to Richard Lang, Carnegie Museum archaeologist. These early peoples grew corn, beans, and perhaps other crops on the rich bottom land by the river, now known as ‘The Bottoms’—which stretches to the McKees Rocks Bridge. They lived by farming, hunting, fishing, digging mussels from the stream, and gathering wild fruits, nuts and edible roots. They defended their villages with bows and arrows and broad-based spears, which they threw with great accuracy by means of an ingenious device called an atlatl. Since these people are known only by their works, their fate is unknown. They may have been destroyed by disease or famine, have moved on because the land’s fertility was used up, or have been slain by some wandering and more warlike people. The next definite occupants of the town of whom traces can be found were of theAdena, or Mound-Builder culture, and lived here shortly after 1,000 B.C., about the time King Solomon was ruling in ancient Israel. They began building the famous mound, of which only a part now remains. It began with a burial inside one of the houses, with the bodies laid in a pit dug into the floor. Then earth was piled over and around the house, which was burned before the work was complete. Special thanks to Fran Beck for reference material used here. 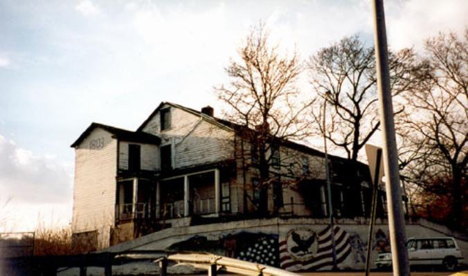 Mann’s Hotel on Singer Avenue (now demolished), dates back to the 1700s when it acted as a trading outpost. The first white men to reach this area were of French or French-Indian descent who lived in harmony with the native inhabitants and were more interested in trapping, hunting and trading than in conquest. In 1748 Peter Chartiers, whose lineage was French and Shawnee, led a small band of several hundred Shawnee into the area. He apparently was a man of great local importance, made peace with the Delaware who had migrated from the east, and operated a successful trading post at the mouth of the creek that bears his name. During this period the different Native American tribes moved in and out of the area with frequency, bringing a colorful cast of characters that would rival days of Mayor Dave Hershman and Max Homer. In 1753, for example, the Delaware King Shingas, known by his detractors as “Shingas the Terrible”, was the political leader of the area. He caused such havoc in raids on English settlements that Pennsylvania placed a $350.00 reward on his head. However, he died in 1764 before being captured, with the reputation among his supporters as the greatest Delaware warrior of his time. During the middle of the 18th century other great Native American personages could be found here. Among these are Queen Aliquippa, female Chief of the Seneca people who wielded considerable power and Andrew Montour, half-European, half Native American who served as a sophisticated British guide and interpreter. Although Peter Chartiers was the first white settler in this area, he was followed in rapid succession by notable American explorers such as Christopher Gist, John and George Mercer and George Washington. Their explorations were primarily made on behalf of the Ohio Company of Virginia who planned to build a town here to counteract the French dominance in the area. Interestingly, the Ohio Company planned to build a town here known as Saltzburg to attract settlers from that German city. This could explain why many of the early settlers and farmers in this area were of German descent. Most know the familiar story of Gist recommending that a fort be built at the Indian Mound. 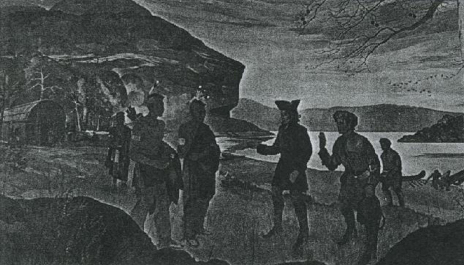 However, when George Washington first visited the area in 1753 and negotiated with King Shingas, he rejected Gist’s site in favor of the Point. Washington concluded that the location at the Mound was “greatly inferior” since the steep slopes of the Mound would make the project difficult, expensive and far more difficult to defend. McKee built a substantial house 200 yards from the mouth of the creek in the area of River Road. George Washington dined here in 1770 and refers to the house as a “Mansion” with eight rooms. This first venerable structure existed until 1902 when the P&LE, which had used it as an office from 1886, tragically burned it. Interestingly, Washington also refers to “Chartiers Creek” in his diary indicating the name was commonly used by early visitors. Trouble for McKee came during the Revolutionary War. He was a staunch British supporter and spy and was forced to flee his home in 1778 when soldiers at Fort Pitt were sent out to arrest him. James McKee assumed the title to his brother’s lands, and historians believe that the name McKee’s Rocks can be attributed to early settlers at the Point, referring to this area of the Indian Mound and McKee’s mansion as such. His descendants lived in this area for more than 125 years.